On 29 and 30 September 1938, the British Prime Minister Neville Chamberlain and the French Prime Minister Edouard Daladier met at Munich with the German Fuhrer Adolf Hitler and the Italian Duce Benito Mussolini. An agreement was reached on Nazi Germany’s territorial claims against democratic Czechoslovakia, but no representative of the Czechoslovak Government was present. At the time, most of the British regarded the Munich Agreement as having bought peace; subsequently they all came to learn that it was a false peace; but what most British people to this day do not fully comprehend is the territorial price that was paid by the Czechoslovaks for that all too temporary peace. In total, Munich and its aftermath – once the Hungarians and Poles had pressed their claims – resulted in Czechoslovakia losing over a quarter of its entire territory and about a third of its population. In strategic terms, the most serious loss was the German acquisition of the mountains, which provided the Czechoslovaks with a natural protective barrier, together with a line of special fortifications. In effect, this annexation guaranteed that Czechoslovakia could not effectively defend itself against Germany. Six months later, on 15 March 1939 - the fateful Ides of March – German troops marched into Czechoslovakia and the Czechoslovak armed forces were ordered to offer no resistance, since any such opposition would have been futile. In the weeks that followed the occupation, thousands of Czech soldiers and airmen managed to leave Czechoslovakia, most of them escaping to neighbouring Poland before sailing to France. Until war was formally declared, the French assigned them to the Foreign Legion in north Africa but, on the commencement of hostilities, the Czech airmen were drafted into the Armée de l’Air and, in May 1940, took part in the short-lived Battle of France. The rapid fall of France then led to some 4,000 Czechoslovak soldiers and airmen leaving France to sail to Britain – the last line of defence between democracy and fascism. The first 30 Czech pilots to reach Britain landed in an RAF aircraft at Hendon on 17 June 1940. Next day, the Czech President-in-exile Dr Eduard Benes wrote on behalf of the Czechoslovak National Committee to the British Secretary of State for Air, Sir Archibald Sinclair, pleading that a special effort be made to bring the remaining Czech airmen out of France and over to Britain in order that they could continue the fight. Then, on 2 July, he submitted to the British Government a memorandum urging that the Czech airmen be allowed to participate at once in the defence of Britain and that a formal agreement covering the status of Czech military personnel in Britain be concluded as soon as possible. The British Government acted quickly: within a month of the Benes memorandum, a Czech fighter squadron and a Czech bomber squadron had been formed. The Czechs were desperately eager to fight and they brought invaluable flying experience and an unquenchable hatred of the Germans who were occupying their country. For its part, the Royal Air Force needed as many trained aircrew as it could muster as what was to become known as the Battle of Britain was about to commence. However, there was no time to conclude a formal agreement on the status of the Czechoslovak airmen prior to their deployment in the RAF. Therefore all Czechoslovak officers and airmen were immediately commissioned or enlisted in the Royal Air Force Volunteer Reserve (RAFVR). Originally all officers, irrespective of their Czechoslovak rank, were commissioned in the rank of pilot officer, the lowest commissioned rank in the RAF. The only exceptions made were in the case of flight and squadron commanders who were necessarily granted the appropriate acting ranks. All airmen were enlisted with the lowest possible classification of aircraftsman 2nd class and awarded a higher acting rank to fill establishment posts as applicable, so that most were soon granted the temporary rank of sergeant. In the beginning, the Czech airmen were concentrated at the Czech air Force depot at Cosford, near Wolverhampton, through which they all passed before they joined a squadron. It has to be admitted that, at this sensitive time, relations between the Czechs and the British were not always of the best. Munich was still fresh in Czech minds and the British were seen by some to have failed to stand by Czechoslovakia. More generally, the Czech fliers had by now developed something of a detached, rather cynical, even a little superior attitude characterised by the Czech maxim ‘Všecko známe – všude jsme byli’ (‘We’ve been everywhere – we know everything’). But this feeling soon passed and any doubts about Britain’s commitment to the war effort totally evaporated. The incorporation of the Czechs in the RAFVR and the formation of the Czech squadrons was all part of a process formally recognised in an official agreement between the British Government and the provisional Czechoslovak Government concluded on 25 October 1940. It was signed by the respective Foreign Ministers, Lord Halifax and Jan Masaryk. The agreement confirmed the employment of the Czech airmen with the Royal Air Force, the personnel being members of both the RAFVR and the Czechoslovak Armed Forces, subject to the laws of both forces. Any cost of maintaining the Czechoslovak military effort was to be refunded by the Czechoslovak Government from credits granted by the British Government. Emotionally what mattered most to the Czechs was that, together with the RAF ensign, the Czechoslovak flag – with its blue, white and red segments – was to fly at all stations where Czechoslovak units were based; aircraft used by Czechoslovak units attached to the RAF would carry, as well as British military marks, a distinctive Czechoslovak marking – actually a lion – on the fuselage; and the normal RAF uniform was to be proudly embellished on both sleeves with a distinguishing badge bearing the word ‘ Czechoslovakia’. Originally the interests of the Czech pilots in Britain had been entrusted to RAF commanders who were responsible for their administration. Then, with the drawing up of the agreement, an Inspectorate of the Czechoslovak Air Force was established. It was based in London and responsible to both the British Air Ministry and the Czechoslovak Ministry of National Defence. Acting Air Commodore Karel Janoušek was appointed Inspector-General. From the end of 1942, a member of the Inspectorate called Ladislav Sitenský - who had previously served in 312 Squadron - was charged with taking photographs and filming the activities of the Czechoslovak squadrons. Most of the Czechs who joined the RAF trained at No 6 Operational Training Unit (OTU) at Sutton Bridge beside the Wash before going into specially formed Czech squadrons. These squadrons all had numbers in the 300 range, since RAF practice was that units of Allied personnel who had escaped from Europe should carry numbers in this series: the Czechs were allocated six (310-315) but in the event only used four. On 10 July 1940, the first Czech fighter squadron 310 was quickly established at Duxford. 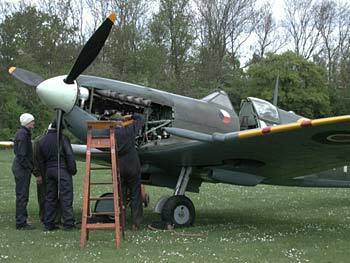 It became operational on 17 August and its Hurricanes fought in the Battle of Britain. The squadron’s English motto was ‘We fight to rebuild’. was built by Westland Aircraft at Yeovil and was issued to No. 310 (Czech) Squadron at Duxford in 1942. 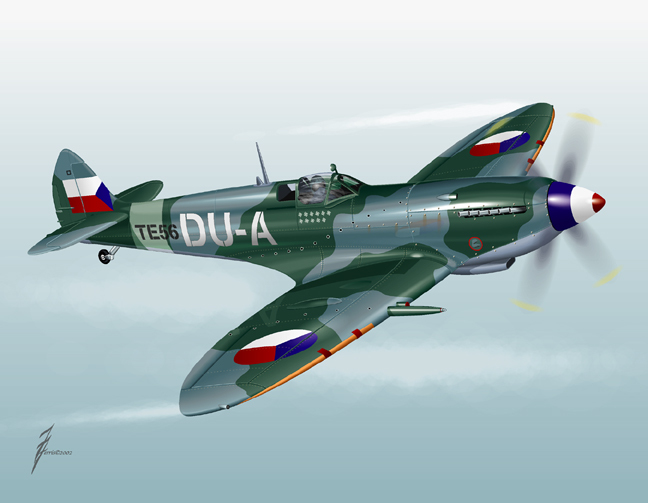 AR501 is painted today in the markings it wore during this time as piloted by František Doležal. Less than three weeks after the formation of 310, a second Czech squadron 311 was formed at Honington on 29 July. This was a bomber squadron equipped with Wellingtons and commenced raids on 21 September. Its Czech motto was the Hussite slogan ‘Na množství nehleďte’ (‘Ignore their numbers’). According to an official minute, by 2 August there were 481 Czech airmen at Cosford, 245 at Honington and 169 at Duxford, making 895 in all. On 29 August, a second Czech fighter squadron was able to be set up. Like 310, 312 Squadron started at Duxford with Hurricanes – it became operational on 2 October, just in time to join the Battle. Its Latin motto was ‘Non multi sed multa’ (‘Not many but much’). Almost a year later, the fourth and last squadron within the RAF was created – it was a third fighter squadron. 313 was set up at Catterick on 10 May 1941 flying Spitfires. For this squadron’s motto, it was back to Czech: ‘Jeden jestřáb mnoho vran rozhání’ (‘One hawk chases away many crows’). In April 1942, 311 Squadron was transferred from Bomber Command to Coastal Command, switching in mid 1943 from Wellingtons to Liberators. 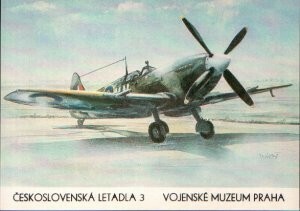 Then, in February 1944, the three Czech fighter squadrons - now all operating Spitfires - were assembled into a Czech Wing, No 132 Wing of the Second Tactical Air Force (2nd TAF), and they operated together almost all the time until the end of the war. While most of the Czechs went into these special squadrons, about 100 others served in RAF and Allied units. Most notably, following its reforming on 10 January 1941, No 68 Squadron – which flew Blenheims and then Beaufighters on night fighter duties – received a particularly high proportion of Czechs throughout the war, so much so that it had a Czech flight and a Czech motto: ‘Vždy připraven’ (‘Always ready’). The other RAF unit that hosted a good number of Czechs was the legendary No 1 Squadron with whom a total of 31 Czechs flew Hurricanes, including the night intruder ace Karel Kuttelwascher. Officially the Battle of Britain commenced on 10 July and concluded on 31 October 1940, although inevitably there is a degree of arbitrariness about these dates. The turning point was 15 September and therefore we celebrate the Battle on the nearest Sunday to that date. The British cannot be reminded often enough that, in the so-called Battle of Britain, no less than one-fifth of the Royal Air Force's 2,927 pilots were not in fact British. There were many from the Commonwealth nations, including 101 New Zealanders and 94 Canadians. The remainder included 147 Poles and 88 Czechoslovaks plus 29 Belgians, 14 Frenchmen, 10 Irishmen, seven Americans, and even a Palestinian. Many of the Czechs served with the two Czech fighter units that were formed in time to participate in the Battle: 310 Squadron established on 10 July and 312 Squadron created on 29 August. Both these squadrons were equipped with Hurricanes. 310 was at Duxford throughout the Battle, while 312 started out at Duxford and then moved up to Speke near Liverpool. Of course, neither of these locations was really at the heart of the conflict. 310 Squadron's first engagement with the enemy came on 26 August. The Czechs claimed destroyed two Dornier Do 17s and one Messerschmitt Bf 110, but two Hurricanes were lost and another two were damaged. The unit's commander Squadron Leader George Blackwood wrote about this clash: "Then I saw how Czechoslovakian airmen can fight. There was no need of commands by radio; they dashed at Germans without abashment. Excepting the fact that I have been shot down in this fight, I was absolutely content with the result of the first encounter". By the end of the Battle, the pilots of 310 Squadron had claimed 39 German aircraft shot down. In his definitive 1977 account of the Battle of Britain entitled simply “Fighter”, Len Deighton wrote: ”Poles and Czechs were not permitted to participate in the air fighting until they had mastered the rudiments of the English language and flying procedures. When they did start operations, these homeless men, motivated often by a hatred bordering upon despair, fought with a terrible and merciless dedication”. Fascinatingly, of the top ten scoring RAF pilots of the Battle (achieving 14 or more victories), one was Czech, one was Polish, one was Australian and two were New Zealanders. 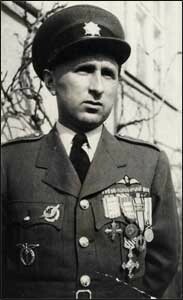 The Czech was Sergeant Joseph František who had been a pre-war pilot with the Czechoslovak Air Force. He was born in Otaslavice near Prostějov on 7 October 1914. Like Christ, he was the son of a carpenter, but he most certainly did not have the Lord’s temperament for he was regularly involved in various disciplinary proceedings resulting from absences from barracks or fights in pubs. After the Germans marched into Czechoslovakia, he crossed over into Poland where he later fought against the Luftwaffe for three weeks until fleeing to Romania where he was interned. He escaped from the camp, travelled through the Balkans, and eventually reached Syria before embarking for France. Here he took part in the Battle of France, flying with the Polish Air Force as part of the L'Armée de l'Air. According some accounts, he shot down 11 enemy aircraft, but there is no documentary evidence for these claims. On eventually reaching Britain, František was posted, not to one of the two Czech fighter squadrons, but – at his request - to a Polish unit: 303 Squadron at Northolt, in north-west London. As the months went on, the Czechoslovak Air Force never reclaimed him – they could do without the disciplinary problems – and the Poles had to come to terms with this ebullient character. For all his flying and shooting skills, František lacked air discipline and more than once his conduct – chasing madly after Germans – endangered the men who flew with him and so, after repeated reprimands, he was allowed to fight his own war with spectacular success. His Polish comrades called this “metoda Frantiszka” (Frantisek’s method), while the British spoke of his lone wolf tactics. František scored his first kill under British skies on 2 September 1940 when he shot down a Messerschmitt Bf 109. The very next day, he took out a second enemy fighter. On the 5th, he destroyed both a Bf 109 and a Ju 88; next day, he bagged another Messerschmitt; and on the 9th he shot down both a Bf 109 and an He 111. On 10 September, he himself almost met his end when his badly damaged Hurricane was totally destroyed on landing. On the 11th, amazingly he destroyed three German aircraft: two Bf 109 fighters and an He 111 bomber. The height of the Battle was on 15 September when 303 Squadron achieved no less than 16 victories, one of them – a Bf 110 - going to the Czech. He claimed another Bf 109 on the 18th and two He 111s on the 26th. On the 27th, he destroyed two Bf 110s and on the 30th a final Bf 109. That made a total tally of 17 kills. 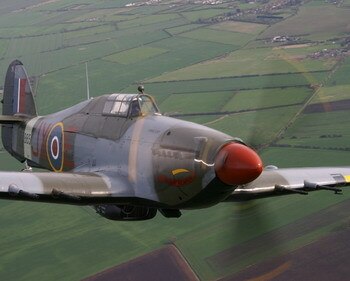 At this time, František was flying Hawker Hurricane Mk I R 4175 coded RF-R. Tragically, on 8 October (the day after his 27th birthday), he died in mysterious circumstances when he crashed at Cuddington Way in Ewell, Surrey. His neck broke in the impact and he died immediately. In his 1988 biography “Challenge In The Air”, fellow Czech pilot Miroslav Liškutin – who knew František well – wrote that his premature death was "the direct result of battle fatigue and sheer physical exhaustion”. Josef František was posthumously awarded a second Distinguished Flying Medal. He was buried with his Polish friends in Northwood where he still rests. But Frantisek was not the only Czechoslovak pilot to die in the Battle. There was Jan Chalupa, Ota Jirsak, Karel Klimt, Josef Slovak, František Koukol, Karel Kunka. All “the Few” flew and fought – and many died – that we might live in freedom. Almost two years later, another Czech – Flight Lieutenant Karel Kuttelwascher – distinguished himself in spectacular style. Karel Kuttelwascher - or Kut as he was known to all his wartime colleagues - was born in a town now called Havlíčkův Brod. He joined the Czechoslovak Air Force when he was 18 and clocked up some 2,200 flying hours before the Germans occupied Czechoslovakia in 1939 and disbanded the Czechoslovak armed forces. Three months after the invasion, he made a daring escape from Czechoslovakia into Poland by hiding in a coal train. Together with many other Czechoslovak pilots, Kuttelwascher was able to make his way from Poland to France where he was drafted into the Foreign Legion to await the imminent outbreak of war. When war came, he flew with the French Air Force in the fierce but brief Battle of France. He claimed a number of German aircraft destroyed and damaged. Then, when France fell, he managed to reach Algeria, escaped to Morocco, and took ship to Britain where he immediately joined the beleaguered Royal Air Force. He was assigned to the RAF's oldest unit, the legendary No. 1 Squadron in time to earn his place as one of 'The Few'. Kuttelwacher eventually spent a full two years with No. 1 Squadron. During the early circus operations, in each of the months of April, May and June 1941, he shot down a Messerschmitt Bf 109 off the French coast - but his score would not remain at three. Meanwhile No. 1 Squadron experienced more excitement with their involvement in the famous Channel Dash when, on 12 February 1942, the two German battle cruisers 'Scharnhorst' and 'Gneisenau' raced from the French port of Brest and set sail for Norway. In a cannon-blazing attack on three accompanying destroyers, No.1 Squadron lost two aircraft, but Kut saw his shells exploding on the decks of his destroyer and judged the damage to be considerable. By this time, No. 1 Squadron was based at its ancestral home at Tangmere. It was in April, May & June of 1942 that Kuttelwascher – notwithstanding his German surname – became the scourge of the Luftwaffe bombers operating from France and the Low Countries. The type of operation was called night intrusion. This involved flying a long range Hurricane IIC, aptly named the ‘Night Reaper’, over enemy bases during the couple of weeks around the full moon. He would endeavour to locate German bombers as they were taking off or landing, so that they were low, slow and vulnerable to his cannon. In just three months, Kuttelwascher destroyed 15 bombers and damaged a further five. On one memorable occasion, he knocked out three Heinkel bombers in just four minutes. These exploits brought him the Distinguished Flying Cross twice in a mere 42 days. He was the RAF’s greatest night intruder ace and, with his total score of 18, the top-scoring Czech pilot of the Second World War. The wartime media dubbed him ”the Czech night hawk”. In the course of the war, the pilots with the three Czech fighter squadrons were credited with 68 and one-sixth enemy aircraft destroyed plus 37 probable and 59 and one-sixth damaged (and four V-1 flying bombs destroyed), For its part, the Czech Flight of the night-fighting No 68 Squadron flew 1,905 missions and was credited with 18 and a half enemy aircraft destroyed plus five probables and seven damaged (and two V-1s shot down). During service with other RAF squadrons, individual Czechoslovak pilots were credited with a total of 68 enemy aircraft destroyed plus 14 probables and 45 and a third damaged. A total of 31 Czechs flew with No 1 Squadron – more than with any other British unit except 68 Squadron with its twin-crew night fighters – and while with it they destroyed 32 and a half enemy aircraft, probably destroyed another four and damaged 13 and a half. So the total number of kills achieved by the Czechs split fairly evenly between those at Czech and those at other RAF squadrons. Yet, if one examines the service records of the Czech aces, a fascinating picture emerges. Easily the most successful Czech fighter pilots with the RAF were Karel Kuttelwascher with his 18 victories at 1 Squadron and Josef Frantisek with his 17 victories at the Polish 303 Squadron, both men who never flew with a Czech squadron in the war and incidentally achieved virtually all their kills while flying on their own. Although they never flew together, Kuttelwascher and Frantisek were a pair – the most successful Czechs with the wartime RAF, both most effective when operating alone, the one by night, the other by day. The two Czechs with the next highest scores were Otto Smik who shot down nine aircraft and – on the same day – three V-1s, almost all these victories being achieved with 222 Squadron before he flew with the Czech 310 and 312 Squadrons, and Miroslav Mansfeld who is credited with eight and a half aircraft – virtually all at night – and two V-1s, all scored with while with 111 and then 68 Squadrons. The other two Czech aces – that is, pilots with RAF scores of five or more – were Otmar Kučera with five and a half victories, clocked up with the Czech 312 and then 313 Squadrons, and Josef Dygrýn with five victories, all achieved while flying with Kuttelwascher on 1 Squadron, although he spent a short spell with the Czech 310 Squadron. So the top two Czech fighter aces never flew with any Czech squadron and, except for a couple of kills by one of them, five of the six accomplished their victories with non-Czech squadrons. The explanation is that Czech fighter squadrons had much fewer opportunities for their members to achieve kills, since they joined the Battle of Britain late and served mostly north of London and, after the Battle, these squadrons operated mostly as convoy patrols and later as close escorts to bombers with orders to protect their charges rather than seek combat. This deployment of the Czech squadrons in quiet sectors and on less risky operations was deliberate on behalf of the RAF. Throughout the war, the Czech squadrons found it very difficult to maintain their personnel numbers because there was no pool from which to recruit new men, so the best way to keep the units intact was to minimise the risk of losses. By the end of the war, the three Czech fighter squadrons, 310, 312 and 313, had completed 28,335 operational flights totalling 46,905 hours. Flying as a Czech Wing, the squadrons flew four two-hour sorties on D-Day, 6 June 1944, as part of the historic Operation Overlord. Besides the aces who have already been highlighted, there are so many other brave men that one could mention. For instance, František Fajtl - who I have met - has become one of the most celebrated of the Czech pilots, partly through his distinguished service, partly through his extensive writing, and partly through his longevity. He was the first Czech to be given command of a British fighter squadron when he took over No 122 flying Spitfires from Hornchurch. He was later shot down on a raid over Lille but evaded capture and managed to return to Britain. Subsequently he became CO of the Czech 310 Squadron. Another pilot that one could mention is František Truhlář. In 1941, he survived a terrible crash in a Wellington bomber but his face was very badly burned. The famous surgeon Professor MacIndoe rebuilt his face. Then, during the invasion of June 1944, Truhlář had a second crash, this time while flying a Spitfire. Again his face suffered awful burns; again MacIndoe did a reconstruction job. At the end of the war, the now unrecognisable Truhlar returned to his home town of Lomnice and shortly afterwards crashed a Spitfire into the ground near the town. He died in circumstances that were as sad as they were strange. Turning to the Czech bomber squadron 311, during its two years with Bomber Command it flew 1,011 operational sorties totalling 5,192 hours. Some 1,218,375 kg of high explosive bombs and 92,925 kg of incendiary bombs were dropped on enemy territory. After it was transferred to Coastal Command in 1942, the squadron completed 2,102 operational flights totalling 21,527 hours and was credited with four enemy aircraft destroyed and three probables plus 35 attacks on U-boats and four on surface vessels. The squadron was recalled to Bomber Command for the Thousand Bomber Raid on Bremen on the night of 25/26 June 1942. Czechoslovak airmen served in a variety of other roles, especially Transport Command but also Ferry Command, photo reconnaissance, air-sea rescue, and last but not least No 138 Special Squadron dropping agents into enemy territory including occupied Czechoslovakia. The total number of Czechoslovak airmen who lost their lives while serving in the RAF came to 480. The heaviest casualties were suffered by the bomber crews of 311 Squadron: of the 480 killed, 273 came from this one squadron. Furthermore, of the 51 Czech airmen taken prisoner-of–war, 34 were from the squadron. Seven Czechs gave their lives while serving with No 1 Squadron. Here in Britain, the death of all these Czech airmen is commemorated on the Sunday nearest 28 October – the Czech day of national independence – in a simple ceremony at the Czech cemetery in the village of Brookwood in Surrey. At the end of the war, there were some 1,500 Czechoslovaks still serving in the RAF, so that the total number of Czechoslovak airmen who served in Britain was probably around 2,000. We honour and thank them. These brave men should have spent their remaining years as national heroes back in their free homeland – but it was not to be. In February 1948, the Communists staged a political coup in Czechoslovakia and took over control of the government and the other instruments of state. As far as the new regime was concerned, anyone who fought with the western allies was at best suspect and at worst a traitor. Within days of the coup, leading figures were arrested and tried. The head of the Czechoslovak Inspectorate for the wartime RAF Karel Janoušek spent 15 years in jail. Many other airmen were immediately dismissed and all of them were victimised. For the next 40 or so years, their record was virtually unknown in their own country. By the time I made my first visit to Czechoslovakia in 1988, the authorities had turned a blind eye to weekly reunions of a small group of pilots which took place in a pub called “Plzensky dvur” in Prague. But it was not until the ‘velvet revolution’ of 1989 that official recognition was given to these men. By then, of course, many of them were – to use the phraseology of one of my contacts – “flying with angels”. Those who were still alive were in their 70s and 80s. Overnight everyone wanted to hear their stories, so the uniforms and medals came out and visits were made to schools and societies. For a time, they were feted. But these days their numbers are fewer and fewer and many young Czechs are perhaps more interested in hospoda than history. As recently as May 2000, my wife and her twin sister attended the Hradcany Castle in Prague to meet President Vacláv Havel and be presented with another award to mark the wartime service of their father, the night intruder ace Karel Kuttelwascher. 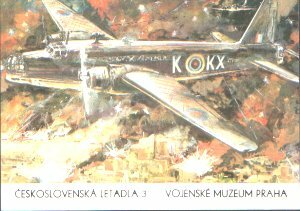 In this article, I want to pay tribute to the fortitude and bravery of each and every man who served with the Czechoslovak forces in the wartime RAF. It took far too long for their story to be told and it cannot be narrated often enough. They fought for our freedom – we remember them and we salute them. Note: The material in this article formed the basis of a presentation at the Czech Embassy in London on 7 September 2000 to mark the 60th anniversary of the Battle of Britain and sections 4 & 5 formed the basis of an article published in the August/September 2000 issue of the "British Czech and Slovak Review". Last updated on 9 June 2017. One Czech pilot had a much less noble record that his colleagues. Augustin Preucil was born in Trebsin, near the German border. Before the war, he joined the air force and became a pilot but, in the summer of 1939, he turned into a German spy. Like so many other Czech pilots, he reached Britain in the summer of 1940 and joined the Royal Air Force. However, after a year of his spying activities, he contrived a flying accident and fled to Belgium in September 1941. Back in Prague, he assisted the Gestapo in interrogating captured Czech pilots. In 1947, he was hanged for his betrayals.